An architect, environmental advocate, and landscape designer of national reputation, Calvert Vaux (rhymes with talks) enriched Mississippi not only by creating its most renowned antebellum Italianate mansion but also by producing a unique trove of sixteen beautifully drafted drawings used in its construction. Born to a prosperous English family on 20 December 1824, Vaux was already a competent architect and exceptional draftsman by 1850, when American writer and landscape designer A. J. Downing hired the twenty-six-year-old to apply his skills in the New World. Within ten years Vaux’s combined practice of residential design and landscape architecture was flourishing along the Upper East Coast, and he had won fame for his role in designing New York City’s Central Park. 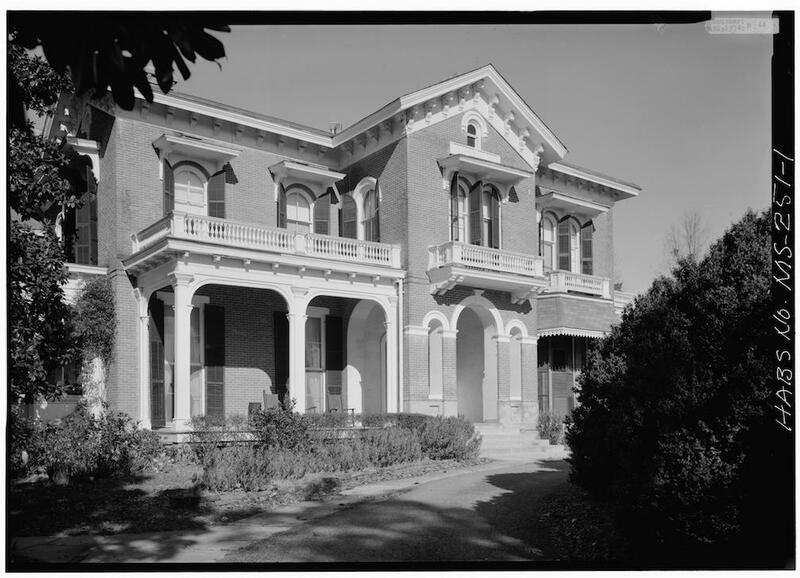 In 1857 Vaux published a popular architectural guidebook, Villas and Cottages, which probably caught the attention of Thomas Pegues, a North Mississippi cotton and railroad magnate with visions of Italianate domestic splendor in his hometown of Oxford. In 1859 Pegues traveled east and viewed his favorite Vaux design, No. 27, in company with the architect. The superbly drafted house plans were soon on their way to Mississippi, with additional pages arriving in 1860. Back home, Pegues hired a local builder, William Turner, who was just finishing St. Peter’s Episcopal Church, Oxford’s Gothic Revival landmark, to realize Vaux’s elaborate designs for a two-story, red brick suburban villa. Whether the architect ever visited the house site, a one-hundred-acre estate on North Lamar Avenue, is unknown. Between 1859 and 1861 Oxford’s most imposing private residence took shape. Its sophisticated, asymmetric Italianate facades, combined with Vaux’s luxurious interior refinements, must have stirred considerable wonder in this little town of elegant but austere Greek Revival vernacular. In wintertime, hot water pipes maintained an unheard-of coziness in library and conservatory, while family members and guests could choose between two indoor bathrooms with the novel feature of running water. Built-in closets abounded, and a grand ballroom could be created by opening the massive pocket doors between the double parlors. Pegues’s home, Edgecomb, reportedly cost around fifteen thousand dollars, an enormous sum for the time. Several of Oxford’s most prominent families subsequently inhabited Vaux’s masterpiece, which was renamed Ammadelle in the early 1900s. The house and grounds now cover a seven-acre parcel, and much of Vaux’s landscaping remains intact. William Faulkner may have had Ammadelle in mind when he described the ever-ambitious Thomas Sutpen and his French architect in Absalom, Absalom! A modified version of Vaux’s Ammadelle design, Mount Holly, was built circa 1859–61 near Greenville, though not under the architect’s supervision. In 2001 the integrity of Vaux and Pegues’s vision in Oxford was assured when Dorothy Lee Tatum conveyed a perpetual conservation easement to the state. The house is now a National Historic Landmark. Vaux continued his distinguished career, designing some of America’s most picturesque parks and rural retreats, until his death by accidental drowning on 19 November 1895 in New York.